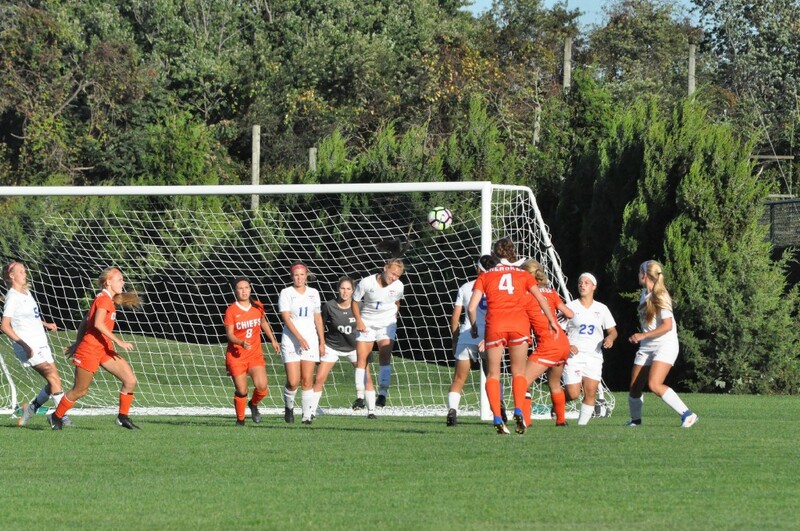 After three weeks of play, Attanasi led the Olympic Conference in goals with 12 and also tallied four assists. Washington Township Minutemaid freshman Amanda Attanasi controls the ball at the Sept. 28 home game against the Cherokee Chiefs. Also pictured, from left, is Cherokee senior Angela Harris, Washington Township senior Brooke Hengy, Washington Township junior Milana D’Ambra and Cherokee sophomore Olivia McMillan. There aren’t many high school freshmen soccer players who can lead their conference in scoring three weeks into the season. There also aren’t many high school soccer players quite like Washington Township High School’s Amanda Attanasi. Attanasi has been a breakout star for the Minutemaids in 2017, scoring 12 goals and tallying four assists in her team’s first seven games. 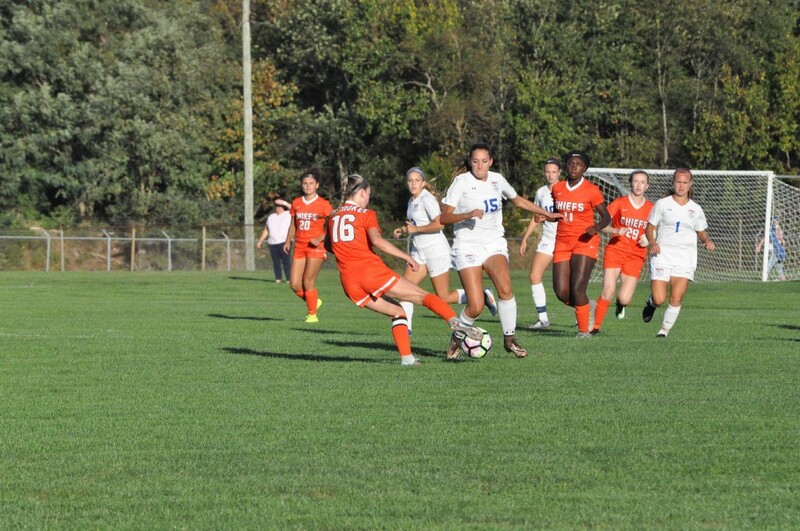 Her performance has helped Washington Township to a 6–1 start to the season. Not only does Attanasi lead her team in goals by a wide margin, she is also the only Olympic Conference player with double-digit goals as of Sept. 25. Despite all of her early success, Attanasi insists goal scoring isn’t her biggest strength. 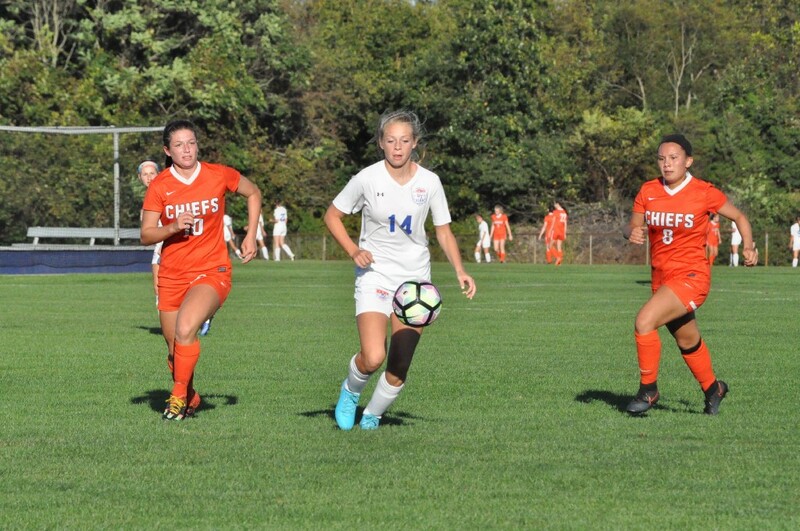 Washington Township Minutemaids took the home field against the Cherokee Chiefs on Thursday, Sept. 28 with a 3–0 win, leaving the Minutemaids with an 8–1 record. Attanasi has spent the past five years gradually working her way up the youth soccer ladder. About five years ago, she picked up the sport, playing intramural with Washington Township youth soccer. She later moved up to the township’s travel program and, after a couple years, joined Rage FC Renegades club team. The Rage would later merge with NJ Rush, Attanasi’s most recent club team. Attanasi’s interest in soccer took off when she began playing club, even though she was a little nervous when she first joined. Attanasi has been a member of multiple championship teams in club soccer and was part of a 2016 U.S. Soccer Region I champion NJ Rush team. When Attanasi moved up to high school this summer, she made her presence known right away. Attanasi knew some of her teammates from the club level and was able to develop chemistry with the varsity team right away. Attanasi faced a number of challenges in the preseason. The first was adjusting to the high school level, which Attanasi believes is far more challenging than what she faced in club. Washington Township freshman Amanda Attanasi (center, №1) defensively heads a ball away from the goal at the Sept. 28 game against the Cherokee Chiefs. Attanasi also picked up a new position this year, playing more at center midfield. This new position requires a lot more running than playing on the wing, Attanasi’s former position. 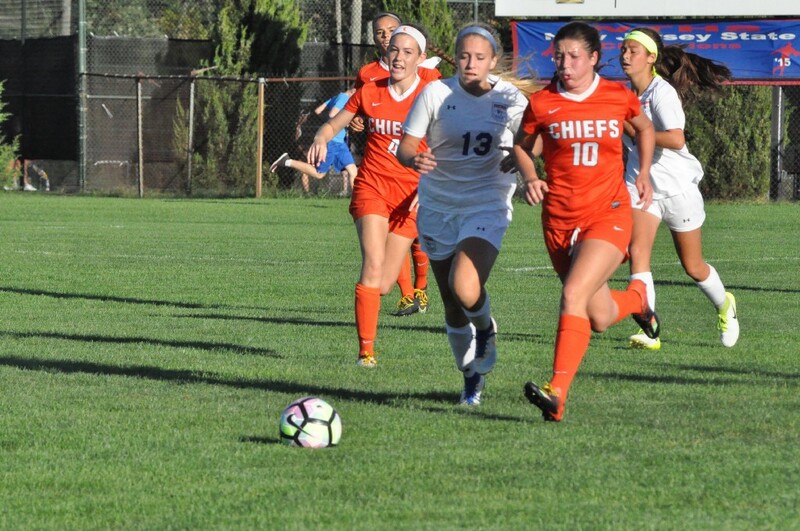 In the season’s first two games, junior Natasha Munro, Washington Township’s top returning goal scorer from 2016, spent a lot of time playing center midfield and teamed with Attanasi to create a powerful one-two scoring punch. The two combined to score seven goals in the Minutemaids’ first two games. However, after Munro went down with an injury in the second game of the season, Attanasi realized she would need to step up at her new position. 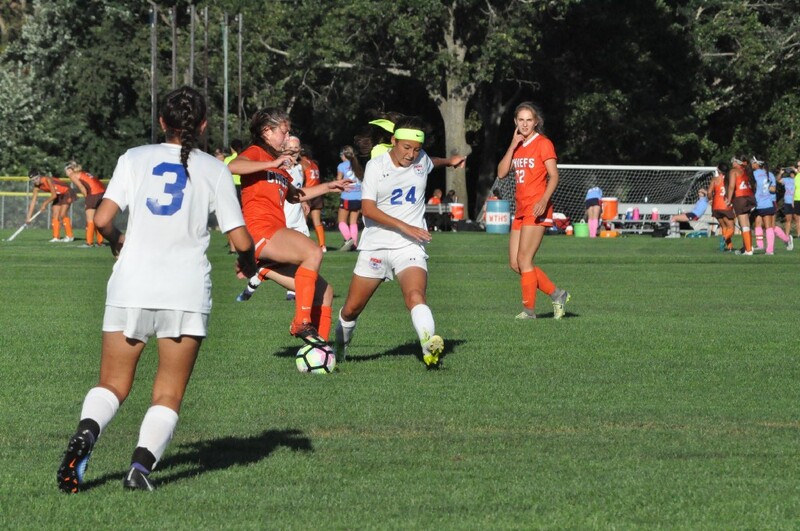 Even after the Minutemaids lost Munro, Attanasi kept up her offensive outburst, scoring both of her team’s goals in a 2–0 win over Shawnee High School and recording her first career hat trick on Sept. 18 against Timber Creek Regional High School. 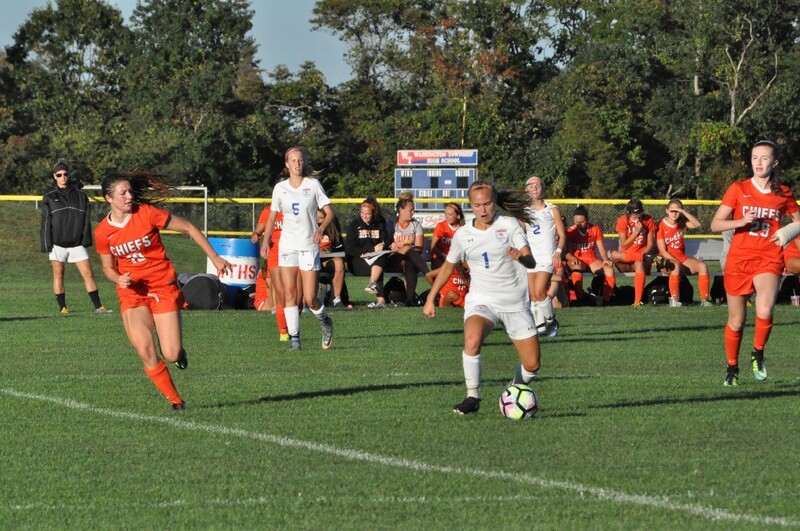 The only game where Attanasi didn’t score in the first three weeks was Washington Township’s 1–0 loss to division rival Eastern Regional High School. The Minutemaids trail Eastern in the Olympic Conference American Division standings heading into October, but with a rematch against Eastern coming up on Oct. 12 and other key divisional games also scheduled for early October, Attanasi said the team is hoping to improve on its September performance.